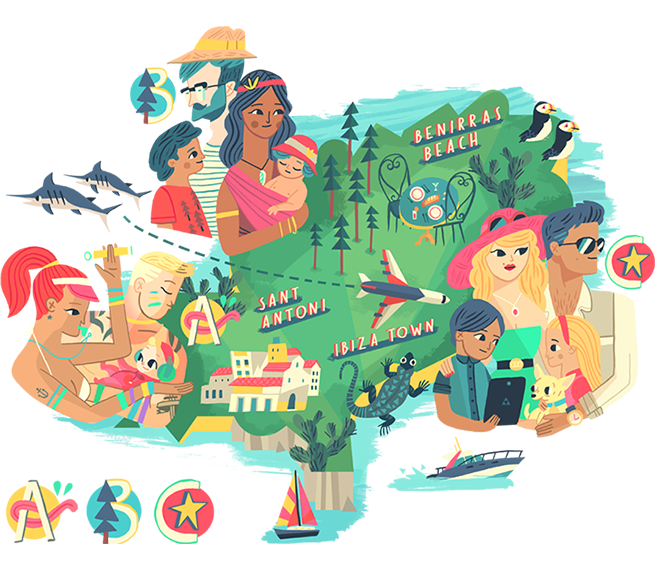 As we were flicking through Easyjet’s ‘Traveller’ magazine we came across this beautiful Illustration from Owen Davey, here’s a short Q & A with the illustrator himself. 1. Can you tell us a bit about yourself and how you go into illustration? 2. How did you get involved with a project in Ibiza? Magazines often contact me out of the blue and ask me to create illustrations for their publication. 3. Have you visited the Island before? 4. What was the brief given to you by Easyjet for the illustration they commissioned? Was it a strict brief or did you have have some creative freedom? A pretty strict one. They gave me creative freedom visually, but everything else was fairly clearly set out, because the body copy was quite detailed already. 5. Can you explain what the illustration depicts. 6. 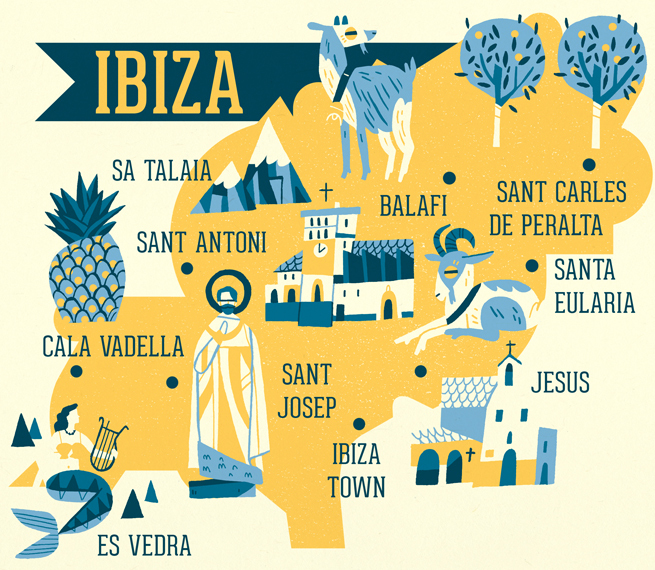 We also saw in your portfolio that you had previously worked on another illustration depicting a map of Ibiza. How long ago did you create this work and what was it for? Couple of years ago I think. It was for CSMA Club Magazine, a Brighton based car and travel magazine. I think it was a suggested tour of the island. 7. Do you think your style has developed since then? How would you describe your style? I’d like to think so definitely. I’m constantly exploring the way I work and hoping to improve on the last piece I created. It’s what hopefully keeps my stuff looking fresh. If I ever started to repeat myself too much, I might as well give up. My style is retro-inspired but contemporary, concentrating on colour, composition and an attention to detail when designing each element within the work. 9. What’s the best thing about your job? Being creative and being my own boss. The worst thing is when you have to be creative when you don’t feel like it, and that you can’t pretend to be ill without your boss knowing you’re lying.